There are different ways of finding an item in our online-shop. You can use the search bar to directly search for product names, item numbers or other terms such as brand, designer or category. If the item you're looking for doesn’t show up in the search results, please look through the other results that were found. Maybe there is a related theme or category that has your item in it. The navigation bar- the headings at the top of every page - can be used to browse our different product categories. Under “Products” you can browse our furniture, lights, accessories, etc. by category. Alternatively, you can find products by a specific manufacturer under “Brands”. In "Discover" you can find our newest products, pieces by your favourite designers, or click through to "Rooms" to find inspiration for a particular area of your home. Through the individual products, you’ll also get a good overview over our large range of products. On most of the overview pages, you also have the option to narrow down the products with a filter. This way you can view articles from a specific manufacturer, or from a specific product category, for example. You can also sort products by price and popularity. Our product pages include a lot of information about colours, sizes and materials of the product, so that you can be properly informed about what you are buying. You will also find information here about the delivery times of the selected product, before you order it. Under the name and item number of your selected product you will see the price and delivery time. The delivery time is split into restocking time, and shipping duration. If the article is not “In stock”, i.e. directly available, the estimated restocking time and the standard transport duration within Germany will be displayed. You will also find information about the shipping method here – if the product is delivered via DHL or freight forwarding, for example. This also affects the final delivery costs. When you have decided on an item, you can add it to your shopping cart with the green button. More details about purchasing products can be found here! With our wish list function, you can create your own personal wish list to send to family or friends. More details about the wish list can be found here! In addition to the individual product images, you will generally find more images of the products in the picture galleries, including detail views, ambience images, or pictures of different variants. Here you will find an overview of all variations of a product in our standard range. The description contains general information, key facts or background information about the respective product. Under Properties, you will find specific information on the selected variant of the product. After selecting the item you are interested in and placing it in the shopping cart (See also Select product), you can of course continue shopping or open the shipping cart and make modifications to your order. 3. or calculate the shipping costs for the desired delivery country (default: Germany). Once the total has been adjusted according to your preferences, you can click on “Continue to Checkout” to continue to the checkout page. If you have already purchased something from our shop or are registered for our newsletter you will have already received, along with a confirmation email, your login information (email and password), with which you can access your customer account. If you have forgotten your password, you can request a new one below. If it is the first time you are ordering from our shop, please register for a customer account at this point. With your customer account, you will need to enter your data only during your first purchase, and we can help you immediately in case of any difficulties or questions, because we can see all processes associated with your orders in our system. Don't worry, your data is safe with us! All information on the subject of privacy can be found here. The mandatory fields are marked with the symbol “*“ – these fields must be completed. These include the following: name, surname, date of birth, street, postcode, city, country, telephone number and email address. Business customers from outside of Germany must also specify the tax identification number (VAT ID). You may also leave any additional comments (e.g. additional address details, prefered delivery dates, or specifications of the ordered goods) in the comment field. If you are ordering on behalf of a company, you will also be able to register as a corporate client, and specify the name of the company and the department. If you wish to receive your ordered goods at an address that differs from the billing address, please check the according box. After clicking on “continue”, you will be able to enter the desired delivery address on the following page. As part of registering for a customer account, you also have the possibility to subscribe or unsubscribe to our newsletter by selecting the appropriate field and checking or unchecking the checkbox. On the delivery page you have the possibility to select shipping options other than standard shipping, for example express delivery (excluding bulky goods and freight forwarding goods). Find further information about shipping costs and about deliveries under the help section Shipping & Delivery. There are different payment methods to chose from. Find out more about the different payment methods on the help page sectionPayment. Please note that all options are available to every customer. Cash on delivery is not possible for customers abroad, for example. The last page before the final order confirmation offers an overview of the order and all entered data. This is your final chance to verify everything! If all the information is correct, please click on the “Order” button to complete the purchase process. Directly after your order, you will receive a confirmation page with some information, e.g. the order number and our banking details in case of advance transfer payments. You will also simultaneously receive an order confirmation via email which also contains all of the important information. You ordered one or more articles, but changed your mind shortly afterwards? Then you can easily cancel your order. In order to do this, log into your customer account as soon as possible and call up your open order under "My Orders". On the order page, you can then cancel individual items by clicking on “x Remove item” or cancel the entire order by clicking on “x Cancel entire order”. orders that have already been processed by us, orders that are based on an external order, such as Amazon or Ebay, or orders that have already been paid. If this is not the case, contact us as soon as possible via telephone at +49 (0) 511 300341-0. You can also send an email to support@connox.com, however the cancellation can be done immediately if you call us. In case of other questions, please do not hesitate to contact us! 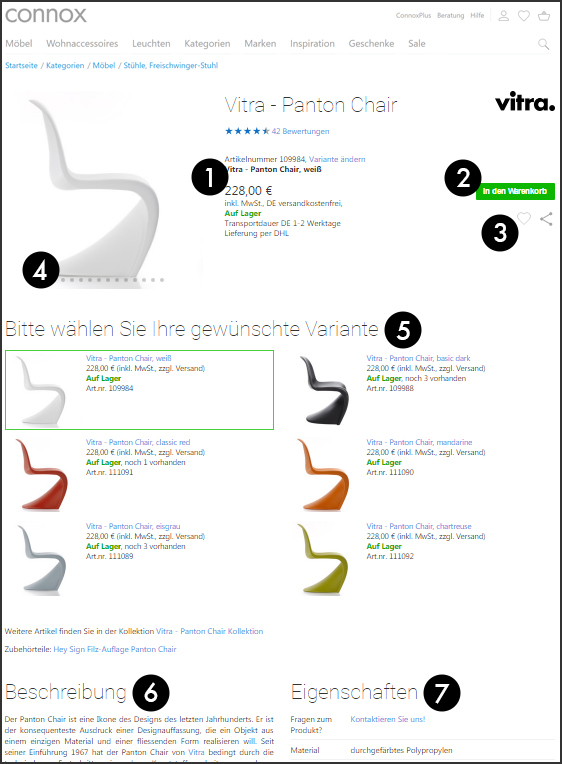 You can view information about your current and past orders in your customer account.After you have logged in, you will find an overview of all order processes such as vouchers, open orders or invoices under “Your Orders”.Detailed information, such as order content and shipping numbers, can be found under the relevant sections. This includes invoices and credit memos which can be downloaded as PDFs.